Study Extracts A, B and C, and then answer all parts of Part 1 which follow. In 2013, overall energy consumption in the UK was the lowest since 1985. Yet there is much more that can be done to reduce the reliance on non-renewable energy from fossil fuels, such as natural gas, oil and coal. The United Nations recommends that fossil fuel use should end by the year 2100. However, resources continue to be depleted and the environment degraded as economic agents do not consider the external costs of their actions. As a result, it can be argued that the price of non-renewable energy is too low and that the signalling and rationing functions of price have broken down. However, other economists believe that energy prices are too high, and are forcing some low-income households to spend a disproportionate amount of their incomes on heating and power. They argue that increased competition in energy markets would lead to reduced prices for consumers. Whatever the reason, many believe that it is vital for more energy to be generated from renewable sources, such as wind, wave and solar power. The UK is recognised as having the best wind resources in Europe and a recent report stated that, in 2013, wind power saved the UK £579m in fossil fuel costs. Even so, wind energy contributes only a small part of the UK’s electricity requirement due to its large initial capital costs and uncertainty regarding future government support. Recently, the Scottish firm, Pelamis Wave Power, a leader in marine energy technology, closed down. Quite simply, it did not have the vast sums of money required to develop the technology further in order to supply electricity in large quantities. However, there is more optimism in Wales, where a private firm, Tidal Lagoon Power Limited, has already secured large amounts of financial support from two financial institutions. It is believed that the project, off the Swansea coast, could produce enough energy to power a small city. Even when firms do have an incentive to join a market, there are barriers to entry. For example, in the north-west, a firm has submitted a planning application to erect up to 20000 solar panels in the countryside. Many believe that solar is a less environmentally-damaging source of energy, yet the scheme has received numerous objections from local residents. Perhaps markets would work better if such restrictions were relaxed. An alternative to these ‘cleaner’, renewable forms of energy is fracking, where water and chemicals are injected into rocks below the earth’s surface to extract shale gas. However, this is a hugely controversial form of energy creation, and the likely benefits of a cheaper energy supply and more jobs need to be weighed carefully against the potential damage to the environment, including the possibility of earth tremors. If fracking goes ahead, tough regulation is likely to be required. Q.1. Define the term ‘external costs’. Answer: External costs, also known as externalities are third party costs suffered by some people/a particular person due to the actions of others. These actions arise from production and consumption of goods and services. These are a loss or gain in welfare of one party because of an action of other party and no compensation is paid. An external cost does not get reflected in the market price of the good. Here, in this extract, the external costs are generated due to the environmental degradation caused by the emissions, pollutants and wastes from fuels. Q.2. Use Extract A to identify two significant differences in the contribution to electricity production by various fuel types between 2013 and 2014. Answer: There have been two drastic changes in the share of contribution to electricity in UK from 2013 to 2014 by various fuel types. Firstly, the share of coal decreased from 33.6% to 20.1% and at the same time, the share of natural gas has increased from 26.6% to 38.6%. 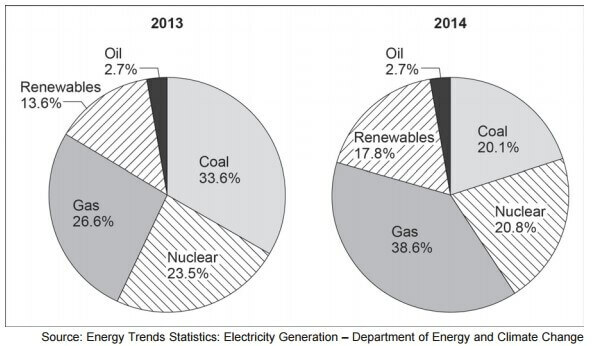 Clearly, there has been a shift from the consumption of coal which was the leading contributor to the electricity generation of UK in 2013 to consumption of natural gas, which had the largest share in 2014. Secondly, there has been a rise in the use of renewable forms of energy from 13.6% to 17.8%. Thus, it can be seen that, renewable energy popularity is increasing and people are now more aware about the environmental impacts of fossil fuels. Q.3. Extract C states: ‘If fracking goes ahead, tough regulation is likely to be required.’ Using a diagram to help you, explain why regulation of firms involved in the fracking process is likely to be necessary. Answer: Fracking is the process of injecting liquid at high pressure into rocks, boreholes, etc. so as to force open fissures and extract oil or gas which is known as shale gas. Fracking is known as hydraulic fracturing provides economic benefits by supplying domestic energy, but think that the benefits do not outweigh the possible negative effects of water contamination and air pollution. This is a cheaper form of gas creation but it does have some negative environmental impacts. Fracking is a negative production externality as it affects the third party which is the environment through over use of water resources, emission of greenhouse gases, contamination of water, earthquakes etc. Due to this, there is market failure in fracking. Thus, regulation of fracking is very important. PS and QS are the socially desirable and is an efficient equilibrium price and quantity, where the market should operate if all cost and benefits are taken into account (including spillover). Because of the fracking method, this brings cost to the society so the marginal cost shift to the left which eventually becomes a marginal social cost curve. 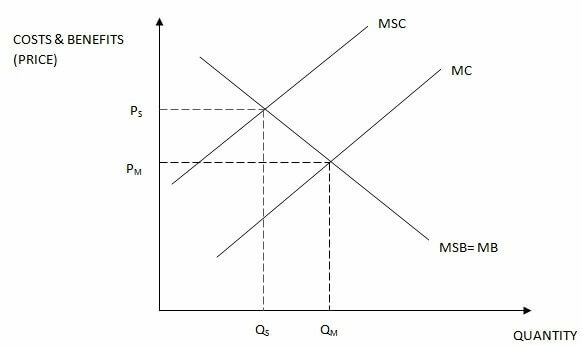 Beside, the MSC curve is higher than the MC curve because the cost of society at that moment is higher than the cost of producers who uses fracking as a method to produce oil. Fracking causes damage to the environment and the cost of the production for producers is surely lower than the cost that society gains. At this stage, the market in-equilibrium occurs. At QS third party costs are less, and society will gain but the actual quantity in the market is at the level of QM. Here, the amount of goods firms can produce would be limited due to which quantity supplied would decrease. The marginal cost would shift left-ward to the new curve called marginal social cost which included the limitation. Government can fix this market failure of fracking by putting a tax on usage of fracking. Tax would decrease the amount of capital that a firm had prepared for the productions; firm would not be able to produce the same amount of oil like before so the quantity supply would increase after tax. Therefore, the price for that product would increase to cover the lost in the quantity supply and less will be bought by the consumers. However, regulation is more appropriate than using the tax because regulation of firms will certainly decrease the amount of fracking, whereas with the tax, firms are still able to produce as much as they want to. The overall goal is to maintain the quantity generated from fracking at social optimum i.e. QS. Using the data and your knowledge of economics, to what extent do you agree with the view that markets can be relied upon to encourage the development of renewable energy? Answer: Renewable energy market is growing gradually. But, markets cannot be relied upon fully to encourage the development of renewable energy because markets works on the profit motive and the incentive to start using renewable energy is less. Setting up of renewable energy is associated with huge capital costs and also, there is uncertainty about the future. Government support is very much important for the renewable resources market because privates sector won’t be able to do it alone. Government is necessary to facilitate smooth functioning and also, it provides financial aid. In these types of markets, oligopoly or monopoly types of power are exercised and these too have its own disadvantages. There are problems in price mechanism, barriers to entry, product differentiation etc. And, market forces alone cannot remove these inefficiencies. Fuel consumption is on a rise and on its way to depletion. Thus, efficient utilization of them is need of the hour. Markets forces will surely speed up the process for development of renewable energy but, it should be profitable for firms to enter into this market otherwise they won’t and, profits from renewable resources market come with some time lag. Also, there are many restrictions in renewable energy market. Thus, both the government and market forces should work together for the development of renewable energy.